The talented breakfast chefs from TreeHouse Point are back on the blog, sharing a recipe for another delectable dish: Winter Tamales. Unwrapping these tamales is an experience fraught with anticipation for what lies within. Inside the hoja, or corn husk, is soft, creamy masa, enveloping poblano peppers; butternut, acorn, and kabocha squash; and chorizo seco. The smoky, roasted poblanos combined with the sweet squash and earthy chorizo make for a comforting, filling, and irresistible dish. La Tamalada is a Latin American tradition where family members join to make tamales around the holidays. Each year, La Tamalada is a time to catch up on familial news, share traditions with younger generations, and enjoy moments spent together. Each Latin American culture has distinct traditional fillings for tamales; for example, many Cubans make sweet tamales with masa flavored with coconut milk and steamed in banana leaves. Chef Fara Rusher grew up making tamales with her family, and insists that the process is meant to be a communal event. She encourages you to host your own Tamalada and try this recipe together with friends and family. Fara's phenomenal tamales can be adjusted for vegans, vegetarians, and omnivores. Using vegetable shortening in the masa and keeping the filling meat-free will ensure that these are vegetarian-friendly. And since masa flour is naturally gluten-free, the vegetarian version of these tamales also qualifies as vegan! Below are recipe cards that you can save and print, followed by a photo guide that breaks down each step. Join Fara, Megan, and Bird as they show you how to make these festive tamales! Peel, scoop, and chop the squash into 1" cubes. Coat with olive oil and preferred spices, and roast in a pan covered with aluminum oil until tender. Seed and slice poblano peppers into strips. Toss in olive oil, salt, and pepper. Remove the casings of the chorizo (optional step). Cut the chorizo into bite-sized portions and fry in a pan until fat is rendered. Remove excess oil (optional step). Remove discolored and badly torn corn husks. Place good husks in a pot and add boiling water until husks are submerged. Place rocks on top of husks to keep them submerged. Keep husks in water until they are soft and pliable. Mix dry ingredients with broth and knead with hands until a soft dough forms. Set aside. Beat lard or shortening until fluffy. Gradually add in soft dough mixture to the lard or shortening until masa is smooth and slightly sticky. When a tiny ball of masa (about half the size of a pea) floats in a cup of water, it is ready. Hold one corn husk in the palm of your hand. If the husk tears or is too small, add a second husk behind the first, overlapping them at the edges to create more surface area. Using a spoon or your fingers, spread a layer of masa dough in the center of the husk. Masa should be spread until about 1/2" - 1" away from the right and left sides of each husk, and about 2"- 4" from the bottom, depending on the size of the husk. Masa can be spread closer to the top of the husk, to around 1/2" away. A thinner layer of masa will hold more filling, so don't spread masa too thickly. Add your preferred fillings to the center of the masa. Left side folds toward the right side and covers the filling. Right side folds to cover the left side. 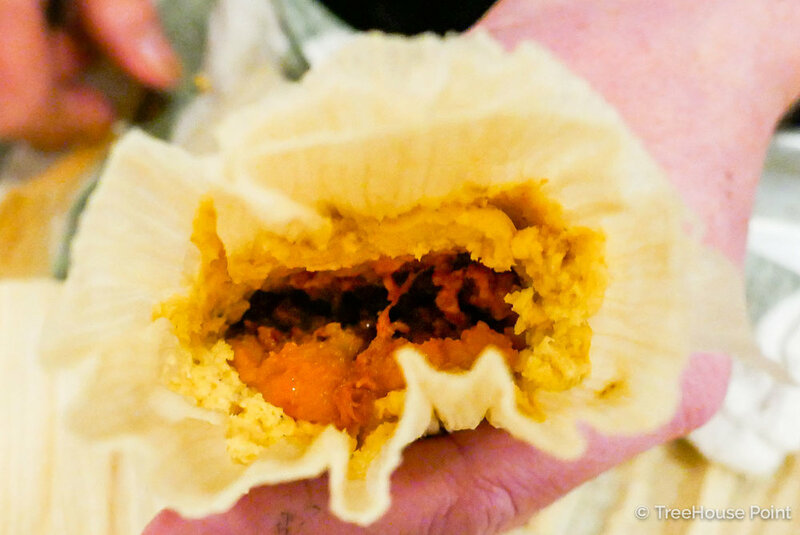 Pinch the filling at the bottom of the husk and fold the tail up toward the center of the tamal. Pinch the filling at the top of the husk to seal it. HOW TO FOLD A TAMAL - VISUAL GUIDE! Happy tamales awaiting the steamer! Fill a pot with a few inches of water and bring to a boil. Place a steamer tray inside the pot. Line the bottom of the tray with corn husks. Place filled tamales upright, with their bottoms down on the steamer tray. Tamales should be tightly packed into the pot. Cover the tops of the tamales with more corn husks. Cover the pot with aluminum foil and lid. Steam tamales until done, around 1 hour. Periodically add more water to the pot by pouring it down the side. You will be able to tell that the tamales are done when they smell like cooked cornbread, and the masa pulls away from the side of the corn husks when prodded. Remove the tamales from the steaming pot when done. Unwrap and eat your delicious tamales! Thank you, Bird, Fara, and Megan for a very happy Tamalada! We hope you've enjoyed learning to make TreeHouse Point's holiday tamales! 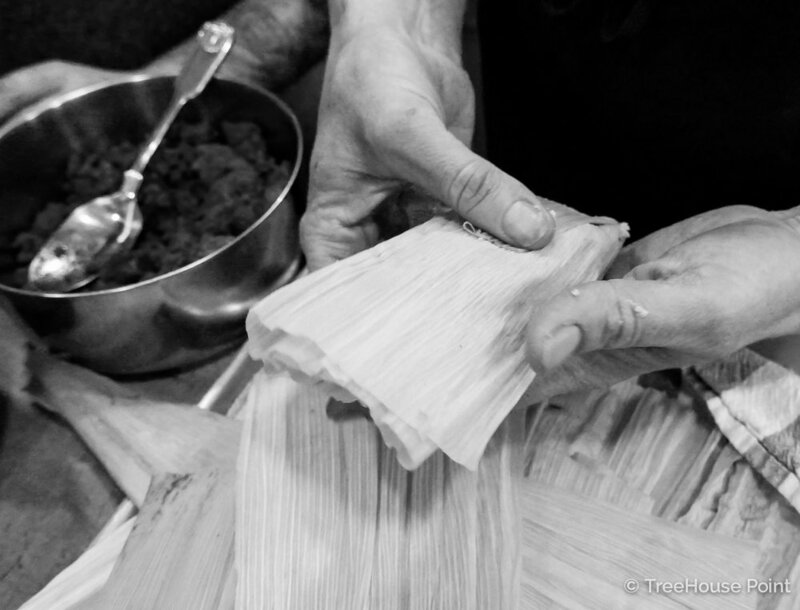 If you make your own winter squash tamales, please tag us at #treehousetamales so we can see!